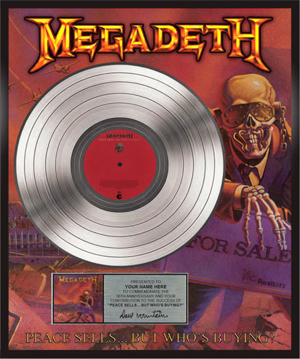 In celebration of the 30th anniversary of MEGADETH's seminal album, Peace Sells… But Who’s Buying?, fans can now purchase a limited edition, customizable collector’s plaque of the release. This limited edition platinum album comes customized with your name. The beautiful 16" x 20” collectible is limited to 250 pieces and includes a Certificate of Authenticity. Order yours now right HERE. As previously announced, MEGADETH leader Dave Mustaine and Music Drives Us Present…Thrashing Through The Snow, an exclusive acoustic performance of holiday songs and MEGADETH hits. Music Drives Us has announced that heavy metal legend Dave Mustaine of MEGADETH will be performing on Friday, December 16th at the Hard Rock Cafe in Boston, MA. This is a once-in-a-lifetime acoustic show where Dave will not only be performing the band’s hits, but also holiday classics. A limited number of tickets are available. Music Drives Us is also offering exclusive VIP tickets that include an eat & greet with Dave prior to the show. All of the proceeds from this special event will support Music Drives Us and their mission of keeping music in New England schools.